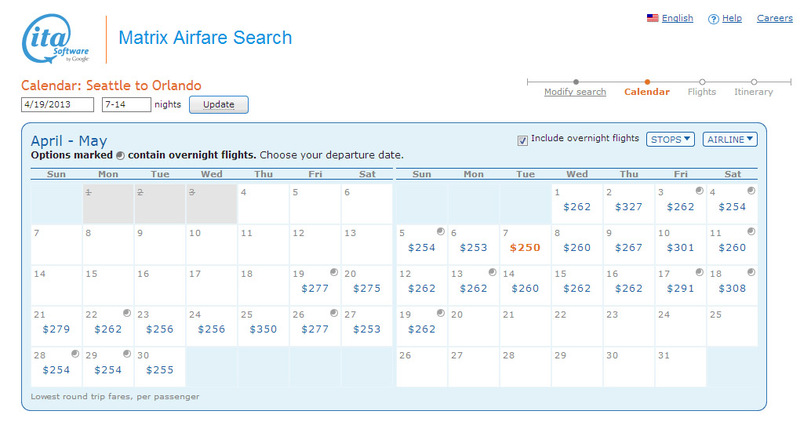 So, I’ve been researching airfare to Orlando like a crazy person. I may have finally nailed it down, hopefully! But, an airfare search is quickly becoming my go-to. I hadn’t heard of it until recently, and if you haven’t checked it out, I definitely recommend giving it a go. ITA Software pioneered airfare searches, and it’s the back-end for many airlines and online search engines. It was acquired by Google a couple of years ago. What’s really cool is that you can do searches directly from the ITA Matrix website, and it seems the searches can handle much bigger and more complex results than say, Kayak. 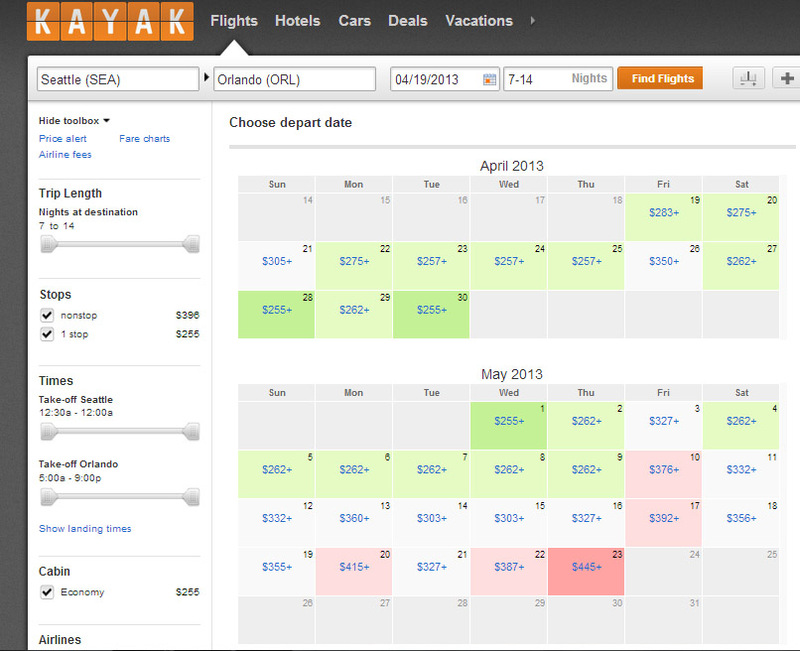 The ITA Matrix search found the lowest priced airfare at $250, where Kayak gave me the lowest at $255 for different dates. From Seattle these are great rates regardless! I also like that the ITA Matrix didn’t bombard me with pop-up windows and showed which flights might be a red-eye. But, there’s one major drawback, you can’t actually book with the ITA Matrix. It only shows airfare that is possible. You’ll likely have to go direct to the airline’s website. I’ll still cross-check with Kayak whenever possible, but I might be sold on the ITA Matrix, at least for now. If you’re a code geek there are even more ways to filter results with the ITA Matrix search, such as specific airlines, alliances, etc. I’m new to this and can’t do any of it justice. However, Scott Mackenzie over at Hack My Trip has put together an incredible 3-part guide to get into the nitty gritty. Check out the full guide here. Glad to see you liked it! Learning to use all of ITA’s features takes time, but it is worth it in the end, like all good things. You are my kind of girl. I am all about saving money. I am super excited to try this out. Maybe for On The Road…. I am featuring this post this week. Thanks for linking up at Travel Tip Thursday and I hope to “see” you again this week! Thank you so much for featuring! 🙂 I really love the ITA Matrix, it finds flight combos that I haven’t seen anywhere else.